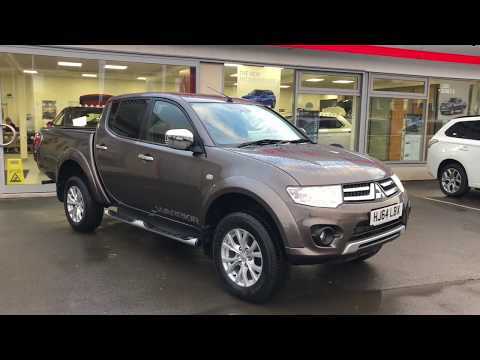 We are very pleased to be able to offer to you, our truly stunning Mitsubishi L200 2.5 DI-D CR Warrior Double Cab Pickup 4WD finished in fantastic Granite Brown with comfortable black cloth interior. This vehicle has only covered 26,845 miles with only one previous owner. The L200 is a durable and capable pickup whether you need a strong 4WD vehicle to tackle any terrain or a reliable off-road vehicle - the L200 is the ideal pickup. This tough work horse also offer a great range of useful specification including; climate control with air conditioning, cruise control, automatic headlights and rain sensor wipers, front and rear electric windows, plus a radio with CD player. Buy with full peace of mind knowing you will receive Mitsubishi warranty until September 2019, 12 month roadside assistance and 30 days exchange programme. This car is available to view and test drive at Croxdale Mitsubishi Durham, our Mitsubishi experts will ensure you receive a fantastic experience. We also have a range of finance options available from no deposit across our used car range. Buy from Croxdale Mitsubishi and you will have full peace of mind of a pre-sales inspection by Mitsubishi trained technicians. We are based on the A167, Durham - 5 miles from Durham City Centre. Let our family look after yours - Call our team on 01388 814671 - we look forward to helping you purchase your new Mitsubishi.